And your purchases are always protected by Verisign's Secure Connection. Classic literature brought to life! A boating accident leaves famed hunter Sanger Rainsford of New York City alone, exhausted, and washed ashore a remote island with a dark reputation. 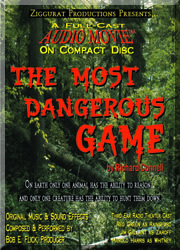 In search of food and shelter, Rainsford happens upon the expansive Chateau of the mysterious General Zaroff, and soon finds himself a player in the most dangerous game he has ever encountered. Experience first-hand as classic literature dramatically transforms into the world of your imagination like never before! A grand soundtrack, spectacular sound effects, and a marvelous cast transport the audience to a far-off land of intrigue and nail-biting suspense. A compelling and captivating listening experience, theatrical and introspective, and ultimately...inescapable!